The magnificent Budweiser Clydesdale hitch is one of the most popular attractions in parades and at horse shows and rodeos all over the nation. By PAT CLOSE, originally published in the January 1977 issue of Western Horseman. This past summer they came to Colorado Springs for the Pikes Peak or Bust Rodeo, and the rodeo parade through town. Like lots of other people, we went to see them where they were stabled, and to visit with the men who travel with the horses, but who never share the limelight. Just about anyone who has ever seen this hitch has probably seen Walt Brady, the manager/driver, because he’s been with them for 36 years. Walt’s crew always includes five men, and presently they are: Bob Bonnarens, Maurice Kruger, Bill Anders, Glen Woolcott, and Don Brady, Walt’s brother. They evidently all have a hankering for traveling, because even Henry Kissinger gets home more fre­quently than they do. Walt told us they travel about ten months out of the year; and when we talked with them in August, they had only been home three days since December ’75. Walt’s crew and hitch work out of St. Louis, and there is also an­other hitch headquartered in Mer­rimack, N .H., that makes appear­ances in the eastern part of the country. Each hitch has ten horses—eight regulars and two spares. They log about 40,000 miles a year, and travel in three specially built vans. Six horses go in one van; four horses and the portable stalls in the second van; and the third one carries the wagon, harness, and ev­erything else. Walt and his crew are unceasingly polite and patient with the crowds that come to see the Clydesdales. Several times a day they will lead one of the big fel­lows from his stall so people can have their pictures taken with him. Dads hoist their kids up on the broad back; and some “older kids” get a boost us so they, too, can have their pictures snapped on top of a 19-hand giant. What size shoe do they wear? How much does the wagon weigh? Are the horses broke to ride? 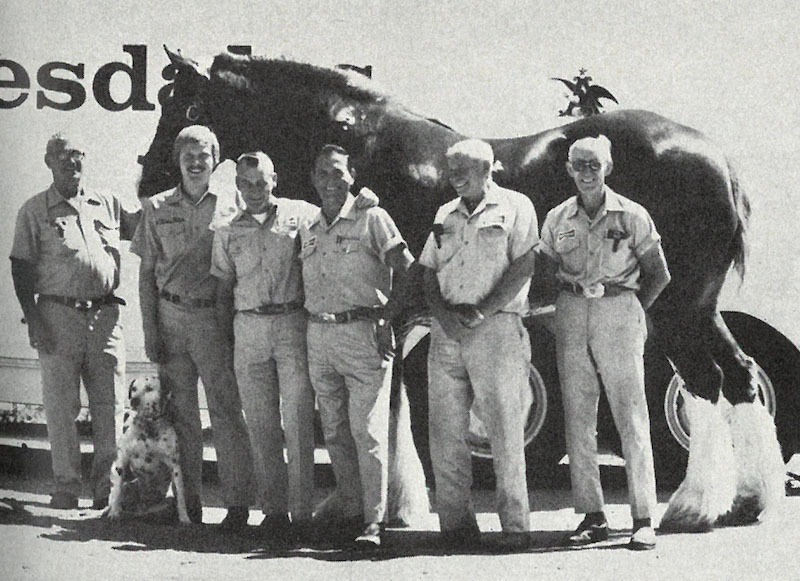 Walt Brady (left) and his crew: Bob Bonnarens, Maurice Kruger, Don Brady, Bill Anders, and Glen Woolcott. The big guy behind them is Jeff, who weighs in at 2,400 pounds and stands 19.2 hands. And the Dalmation is their mascot, Mickey. Probably not many people ask Walt this question, but we were curious how he got started with the Budweiser hitch. 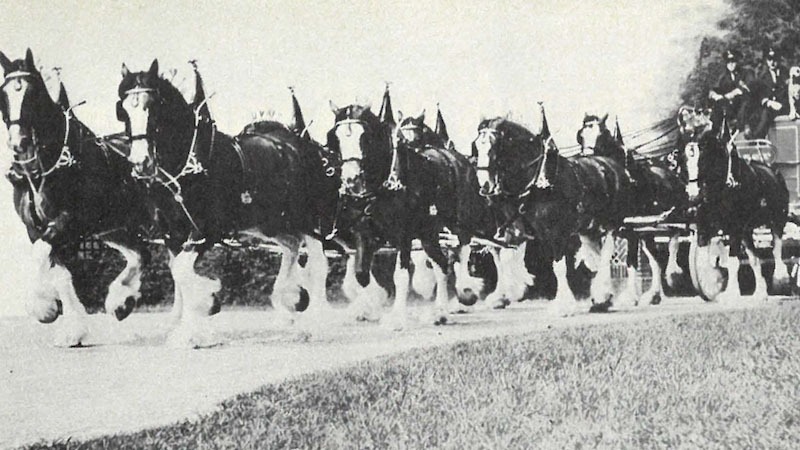 “In the early days, Anheuser-­Busch used beautiful horses and brewery wagons to deliver beer. The echoing clip-clop of hoofs on city streets was as much a part of the sound of those times as the streetcar bell and later the sputtering noises of the horseless car­riage. Prohibition changed all that. Since there was no beer to sell, the brewery naturally had to close its stables. Anheuser-Busch went into other types of business activities… soft drinks, commercial yeast and other products. “But the Busch family were still brewers at heart. When the repeal of prohibition appeared certain. August A. Busch, Jr., planned a special way to commemorate re­peal. He secretly bought a team of Clydesdale horses and had them trained to pull a huge brewery wagon. And the hitch has been rumbling across America ever since. It’s one of the all-time super ideas in public relations and advertising—ranking right up there with the Goodyear blimp!